In 2004, it was less than $300 million. But in 2005, the trade really started to soar, ending the year with $10.8 billion-worth of transactions. A year later, in 2006, the "carbon" market had grown to $31 billion. In 2007, again it more than doubled its turnover, to $64 billion. Last year, it did it again, reaching a colossal $126 billion. By 2020, some estimates suggest the annual value will reach $2 trillion. Not only does this represent a very significant business volume, its stunning growth rate makes carbon trading the hottest item in town, with banks, financial houses and independent brokers piling in to make a killing. The larger part of the market actually comprises the EU's mandatory Emissions Trading Scheme (ETS) – and other very much smaller allowance schemes - accounting for 73 percent of trading volume in 2008. But the whole system is underpinned by what is known as "project-based transactions". These comprise, in the main, so-called "carbon credits" generated by the UN's Clean Development Mechanism (CDM). This mechanism was formally created in 1997 by the Kyoto climate treaty and started operating in a very small way in 1998 building to 78 million "credits" (or Certified Emission Reductions, CERs, as they are formally known) to 333 million this year with a projection of 1.7 billion by the end of 2012. The "end of 2012" is, of course, the key milestone - when the Kyoto treaty lapses. And as the World Bank warned in 2008, then the gravy train could come to an abrupt halt. "Created by regulation," it observed, "the carbon market's biggest risk is caused, perversely, by the absence of market continuity beyond 2012 and this can only be provided by policymakers and regulators." It was those policymakers and regulators who were gathered at Copenhagen for the last two weeks, their primary concern – as Booker points out in his column this week - to protect this new and very valuable business. Thus does he say that Copenhagen was not about global warming but money. The cash that Hillary Clinton so dramatically plonked on the table, rising to $100 billion by 2020, which includes the £1.5 billion offered by Gordon Brown (money which of course he hasn't got) and which like a crazed gambler he last week upped to £6 billion (even more money he hasn't got), was merely a "sweetener" to persuade the developing countries to maintain the money-machine set in motion by Kyoto. And that was the only really concrete achievement of Copenhagen, winning the agreement to the perpetuating of those Kyoto rules that have created this vast industry. That much was acknowledged by John Prescott on Channel 4 News yesterday, who talked up the Copenhagen "accord" – as we must now call it – saying that we had achieved a "Kyoto II" – the essence of which is the carbon trading scheme. Interestingly, this business has two main beneficiaries. On the one hand, there are all those Western "entrepreneurs" who have piled into what has become the fastest growing commodity market in the world. But, on the other are that small number of people in China and India who have learnt how to work this system to their huge advantage, and account for the majority of CDMs. As can be seen from the UN's own statistics - see chart above – these two countries account for by far the majority of the registered schemes, taking a 70 percent share of the total. 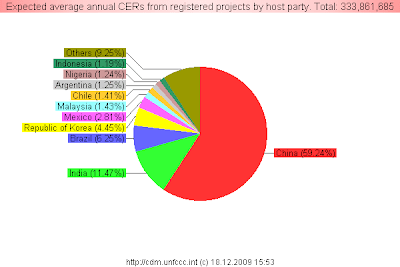 And, of the two, China is by far the bigger player, averaging 197,792,890 CERs as against 38,308,631 from India. The level of China's involvement, as a major beneficiary of the scheme, makes a nonsense of the commentators at Copenhagen who were predicting that China might sabotage a deal. With so much money at stake, there was no way China was not going to fall into line, showing up the much-reported spat between Obama and Chinese premier Wen Jiabao for exactly what it was – pure theatre. Thus does Booker conclude that the part played at Copenhagen by all the tree-huggers, abetted by the BBC and their media allies, was to keep hysteria over warming at fever pitch while the politicians haggled over the real prize, to keep the Kyoto system in place. The only tree they were concerned with hugging was the money tree and all the vast political apparatus that now supports it, allowing governments to tax and regulate us into handing over ever more of our money, largely without realising it, every time we drive a car, fly in a plane, pay our electricity bill or carry out any of a vast range of activities that involve the emission of CO2. Compared with these sums, even the billions we all unwittingly spend on subsidies to the developers of useless wind turbines are chicken feed. The tree-huggers have been well and truly "had" – but then so have we. It is us that are going to pay, through our electricity bills, our taxes and living expenses, in increasing amounts for this hidden bonanza which the negotiators so diligently protected last week. Trading in what amounts to thin air, on the farcical premise that life-giving carbon dioxide is a "pollutant", they have perpetrated the biggest heist in the history of mankind, all to protect "Big Carbon”.